Conveniently located in the centre of the city, 1831 Boutique Hotel offers boutique accommodation with a modern vintage style. Set close to the Sussex Centre, Chinatown and Paddy's Market, the hotel is surrounded by a fantastic range of shopping, dining, entertainment and attractions. The luxury accommodation of Adina Apartment Hotel Sydney Town Hall offers studios and apartments, some with views of the city. Located adjacent to Town Hall train station, the hotel features an impressive range of onsite facilities and is just a short stroll from Chinatown and Darling Harbour. Situated adjacent to Central Station, Adina Apartment Hotel Sydney Central offers self-contained accommodation surrounded by shopping, dining and entertainment. Enjoying easy access to major bus and rail services, the studio and apartment accommodation is complemented by excellent facilities. Located in the heart of the Sydney CBD, Amora Hotel Jamison Sydney offers boutique accommodation with an excellent range of onsite facilities. Each room and suite features spacious bathrooms, offering a separate bathtub and shower. Guest facilities include an onsite restaurant and bars, a swimming pool, gymnasium and day spa. Surrounded by the city's most popular shopping, dining and attractions, Best Western Plus Hotel Stellar offers a unique combination of modern accommodation and a heritage listed façade. Featuring a choice of guest rooms and studios, the hotel is home to all the modern comforts. Enjoying prime position in the famous Chinatown precinct surrounded by the bustling entertainment of the city, BreakFree on George offers a spacious range of apartment accommodation. Featuring a choice of studios, suites and apartments, the hotel offers a great range of amenities and facilities including an on-site Chinese restaurant Chilli & Spicy. Set in the heart of downtown Sydney, Great Southern Hotel Sydney offers comfortable yet affordable city accommodation conveniently close to popular attractions such as Chinatown, Darling Harbour, the Entertainment Centre and more. The hotel also enjoys easy access to Central Station and the rail network. Centrally located in Sydney city, Ibis Sydney World Square offers modern yet affordable accommodation just a short stroll from Cockle Bay, Darling Harbour and Chinatown. Ibis Sydney World Square features great onsite facilities including a restaurant, 24-hour gym, meeting room and more. Offering panoramic views from the luxury rooftop pool and spa, Mantra 2 Bond Street offers well-appointed self-contained apartments and studios within walking distance of The Rocks, Sydney Opera House and Circular Quay. The hotel also enjoys a fantastic range of onsite facilities. Just a short stroll from Darling Harbour, Cockle Bay and King Street Wharf, Mantra on Kent offers self-catering studio and apartment accommodation. Surrounded by Sydney's iconic bar and dining culture, the hotel is home to an outstanding range of facilities. Enjoying an exclusive location, Medina Serviced Apartments Martin Place offers contemporary studio and apartment accommodation in the heart of the shopping and dining precinct. The hotel features well-appointed self-catering rooms and an outstanding range of facilities surrounded by popular attractions. Next to Central Station, Mercure Sydney offers modern accommodation just a short stroll from Sydney's famous shopping, dining and entertainment as well as major attractions including Chinatown and Darling Harbor. The hotel features an excellent range of onsite facilities including a rooftop swimming pool. Located opposite Sydney's famous Capitol Theatre, Metro Hotel Marlow Sydney Central offers stylish accommodation on the corner of Campbell and Pitt Streets. Just a short stroll from major attractions such as Chinatown and Paddy's Markets, the hotel is also close to shopping, dining and entertainment. Located in Sydney city's theatre and entertainment district, Novotel Sydney Central offers stylish accommodation within walking distance of Cockle Bay and Darling Harbour. Featuring a unique rooftop sky garden, plenty of natural light and private balconies or courtyards, the hotel enjoys great views. Overlooking Hyde Park, Oaks Hyde Park Plaza offers deluxe accommodation with views of the city surrounded by the shopping and attractions of the CBD. The hotel is also just around the corner from trendy Oxford Street, which is home to boutique shopping and cosmopolitan dining and night life. Set in the heart of Sydney's CBD, Park Regis City Centre offers deluxe rooms and suites surrounded by shopping, dining and attractions. Boasting 360 degree views of the city, Sydney Harbour and Darling Harbour from the outdoor rooftop pool and sundeck, the hotel also enjoys free WiFi, 24-hour Reception and more. 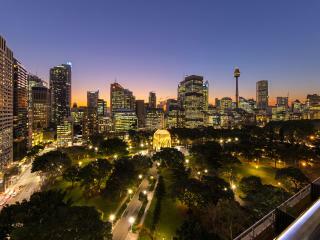 Situated in the heart of the CBD, Pullman Sydney Hyde Park offers luxury accommodation overlooking beautiful Hyde Park. Home to an excellent range of onsite facilities, the hotel is surrounded by shopping, dining and entertainment options and is just a short stroll from Darling Harbour, the Opera House, Chinatown and more. Set opposite Central Station, Rendezvous Studio Hotel Sydney Central offers full service accommodation from one of the most reliable hotel chains in Australia. Just a short stroll to Capitol Theatre and Chinatown, the hotel is only 20 minutes to Darling Harbour, the CBD and Circular Quay. Located on the eastern fringes of the CBD, Rydges Sydney Central offers luxury accommodation and a unique lobby entrance just 200m from Central Station and within walking distance of a range of shopping, dining and entertainment and attractions such as Chinatown, Paddy's Markets and Capitol Theater. Enjoying a prime location in the Sydney CBD opposite stunning Hyde Park, Sheraton on the Park offers 5 star accommodation and a fantastic range of onsite facilities surrounded by a wide range of shopping, dining and entertainment options as well as popular attractions like the Opera House, Darling Harbour and The Rocks. Ideally located in the central business district, Sofitel Sydney Wentworth offers deluxe accommodation and a wonderful range of onsite facilities surrounded by shopping, dining, entertainment and some of Sydney's most popular attractions including the Opera House, Circular Quay and the Royal Botanic Gardens. One of Sydney's oldest landmarks, The Grace Hotel offers elegant accommodation in a heritage listed art deco building in the heart of the CBD. With a fantastic range of onsite facilities, the hotel is surrounded by shopping, dining, entertainment and attractions with easy access to the Opera House, Harbour Bridge, Town Hall and more. Located within walking distance of historic shops, boutiques, pubs and buildings, The Langham, Sydney offers luxury accommodation and an unbeatable range of onsite facilities surrounded by some of Sydney's best attractions and views of Walsh Bay, the Parramatta River and Sydney Harbour. Offering stunning accommodation in the heart of the city, The Westin Sydney boasts excellent onsite facilities as well as exclusive services with the Executive Club. Surrounded by the city's best shopping, dining and entertainment, the hotel is just a short trip to attractions like the Sydney Opera House, Sydney Harbour Bridge and Darling Harbour. Located just outside the city's centre, The York by Swiss-Belhotel International offers a huge variety of stylish accommodation and excellent onsite facilities. Within walking distance of public transport, shopping, dining, entertainment and attractions, the hotel is the ideal base for exploring Sydney. Located just minutes from some of Sydney's top attractions, Travelodge Hotel Sydney offers comfortable accommodation and a convenient range of onsite facilities. Surrounded by the city's best shopping, dining and entertainment, the hotel enjoys easy access to the Aquarium, Chinatown, Darling Harbour and more. Enjoy the comfortable accommodation and convenient facilities of Travelodge Hotel Sydney Martin Place in the heart of Sydney's CBD. The ideal location of the hotel means that all your holiday needs are right on your doorstep including shopping, dining and attractions including the Opera House, Harbour Bridge and Darling Harbour. Centrally located in the heart of Sydney city, Travelodge Wynyard offers spacious accommodation conveniently close to public transport and a range of shopping, dining and entertainment. The hotel also enjoys easy access to a wide range of attractions including the Opera House, Darling Harbour and The Rocks. Situated in the heart of the CBD, Vibe Hotel Sydney offers funky, modern accommodation surrounded by the city's best shopping, dining and entertainment. Conveniently located close to some of Sydney's most popular attractions, the hotel enjoys easy access to Chinatown, The Rocks, Darlinghurst and Darling Harbour.